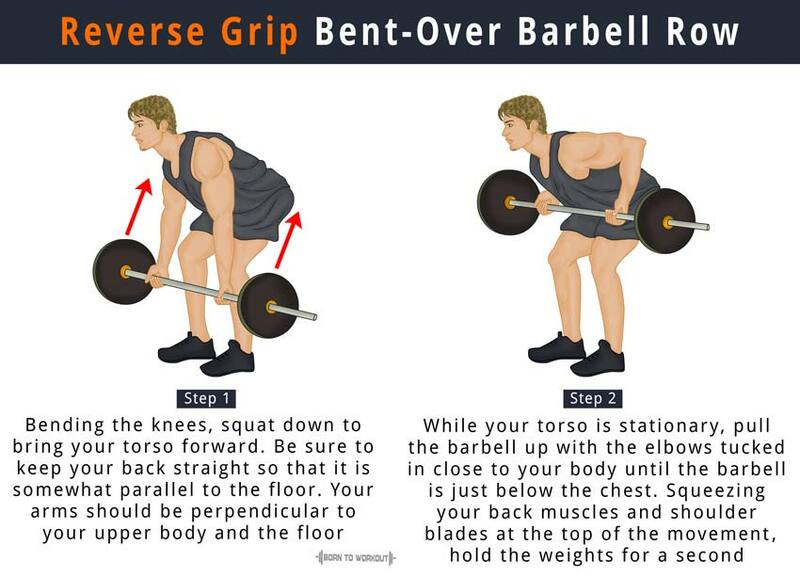 Reverse grip barbell row or simply Yates row (named after Dorian Yates) is an essential strength gaining workout useful for developing not only your back but also your arms and shoulders. When it comes to following a heavy back workout routine, you can do reverse grip barbell rows along with other exercises including low pulley rows, one-arm dumbbell rows, and standing T-bar rows. Since your elbows remain close to the body while performing the reverse grip barbell row, you can easily move heavy weights without causing damage to the joints. It strengthens and stabilizes your back muscles, thereby helping you to work other muscle harder. Stand upright holding a barbell using a supinated grip so that the palms face up and your feet are shoulder-width apart. After bending the knees, squat down to bring your torso forward. Be sure to keep your back straight so that it is somewhat parallel to the floor. Your arms should be perpendicular to your upper body and the floor. This is the starting position. While your torso is stationary, pull the barbell up with the elbows tucked in close to your body until the barbell is just below the chest. Do not exert a force with the biceps except holding the barbell. Squeezing your back muscles and shoulder blades at the top of the movement, hold the weights for a second. Gradually lower the barbell back to the original position. Be sure to keep your head up throughout the entire movement. People with back issues should avoid this exercise, as doing it without the proper technique may cause back injury. Individuals with a healthy back should never slouch their back forward while doing the reverse grip barbell row. Use the weights cautiously. Increase the weight once you get the hang of it.